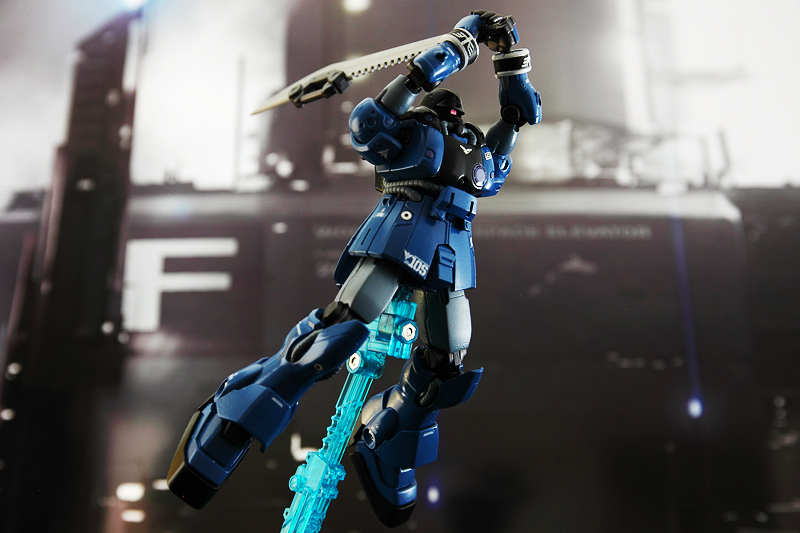 HGUC Schuzrum Galluss with chain mine weapon and Kotobukiya Panzerfaust. As you can see above the HGUC Schuzrum Galluss is nearly complete with some minor painting touch ups and additional decals the only steps left until completion and the full review. I did some top coating using model masters clear coat and dullcote, and after a day constructed the kit. 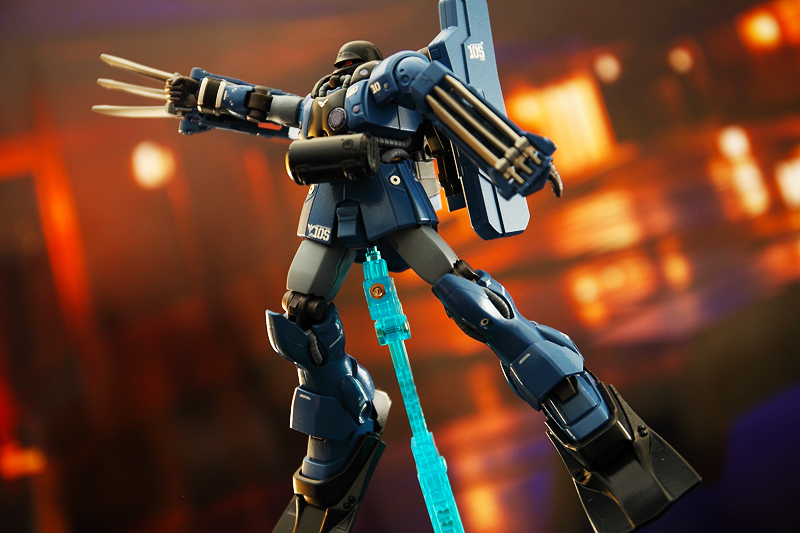 By far this is the most agile High Grade Gundam mobile suit I’ve ever put together, and it doesn’t hurt it looks terrific. 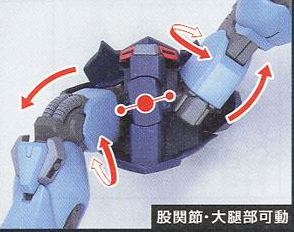 Picture of the connection part of the HGUC Schuzrum Galluss which makes the legs more poseable. The arms and legs are very poseable thanks in part to some construction techniques that I’ve never come across before, specifically a piece underneath the skirt armor to which the legs connect. The piece basically allows more room for the legs to swivel at a more exaggerated stance; a picture to the left from the kit’s manual demonstrates how the piece works and allows more movement. 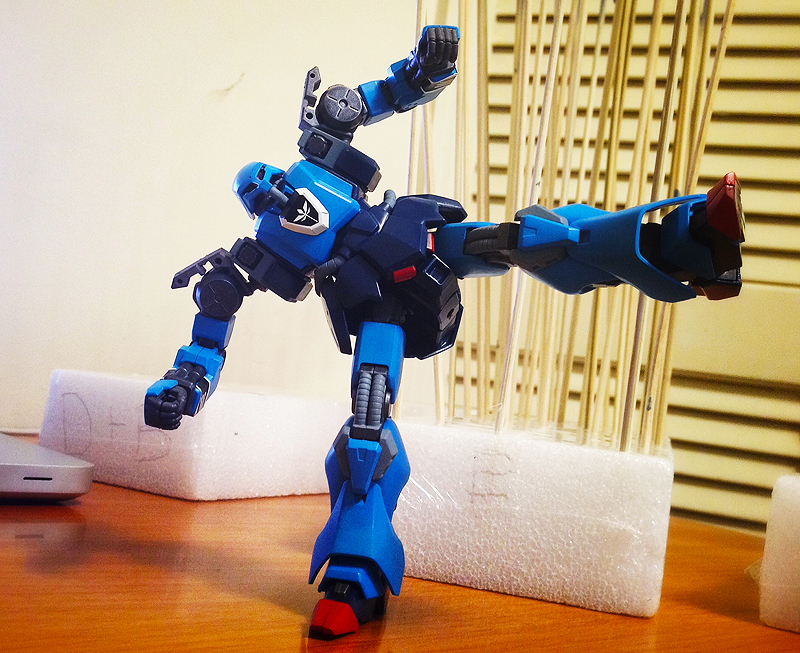 Usually, it’s the arms of an HGUC that has more poseability than the legs, but both the arms and legs have a great range which allows some dynamic poses. 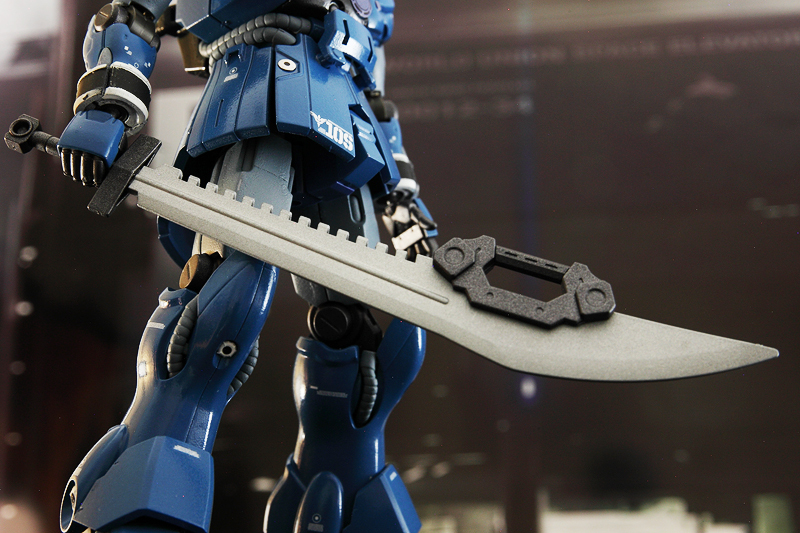 The Schuzrum Galluss, judging by its main weapons and appearance on the Gundam Unicorn anime series, is a close combat mobile suit that showed off some close quarter combat skills in the anime series, like a one legged kick which I’m happy to say is attainable thanks in part to how the kit was designed with the aforementioned legs connector piece and how well the kit is balanced; it’s not a heavy kit. 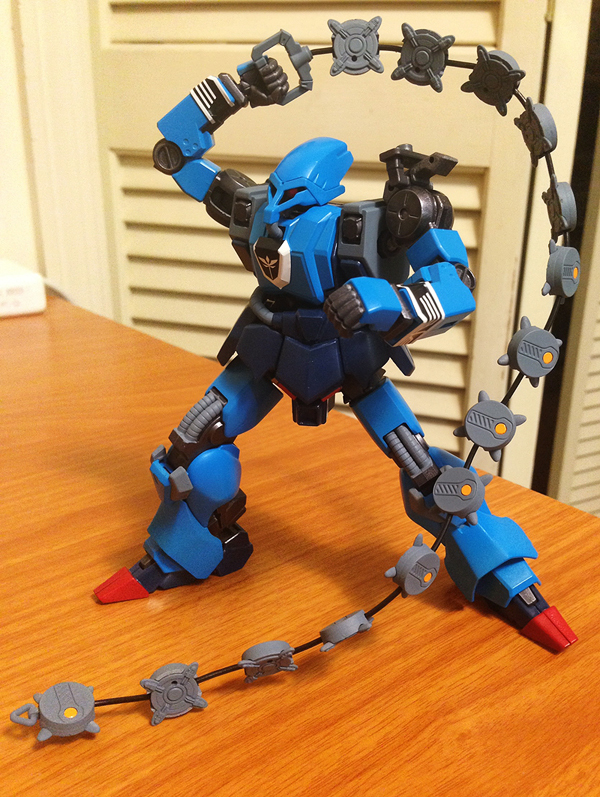 HGUC Schuzrum Galluss is capable of kicking similar to what it did on the Gundam Unicorn anime series. I’ll go into full detail with the kit when I get to a full review which should be coming up sometime next week, but I’m loving the look of the kit and how agile it is. 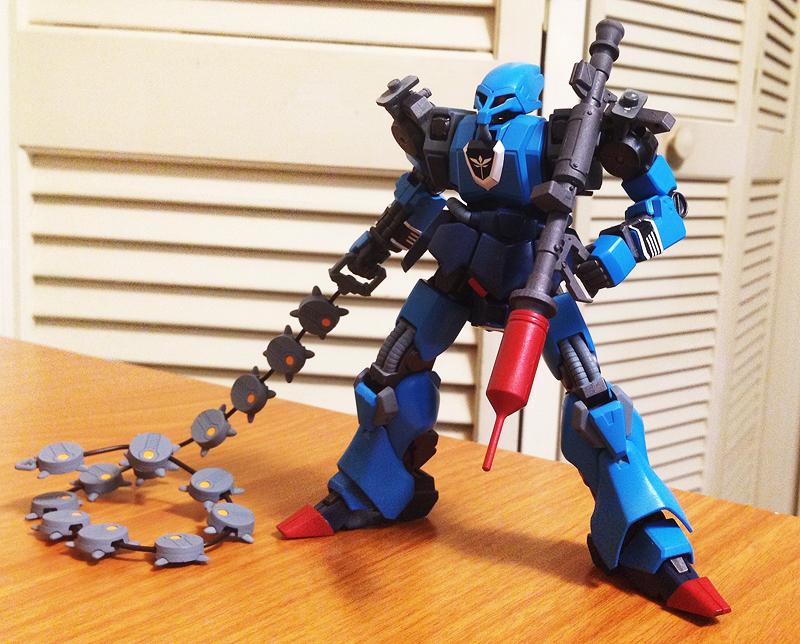 HGUC Schuzrum Galluss and the chain mine weapon. HGUC Schuzrum Galluss inner knee and tubing plate masked to divide inner frame color and tubing color. Work on the HGUC Schuzrum Galluss is going pretty smoothly and quickly. On the third day of work I masked all the parts that weren’t color separated that includes the knee tubing which is molded with the inner frame, the front ends of the feet which are supposed to be red, and two exterior frames that jut out of the front skirt. As you can see from the pics, I used a pretty thin model tape to mask the parts, since I needed some precision when it came down to the actual divide between two colors in some pretty hard to get to spots. And since this was the only masking tape that I had on hand, I also used it to cover the remaining parts that had already been spray painted. 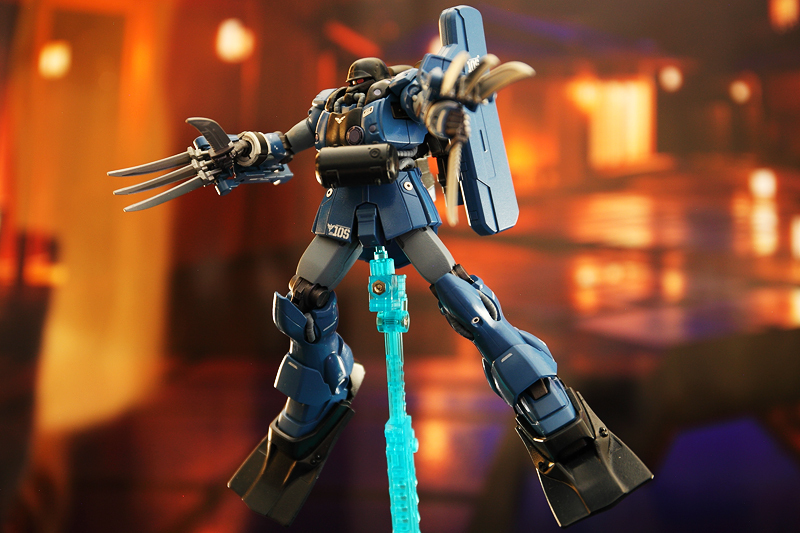 I used Tamiya’s red spray paint for the feet and skirt portions, and Model Masters intermediate blue for the tubing, which I will also use for the rest of the tubing pieces and the mine weaponry. 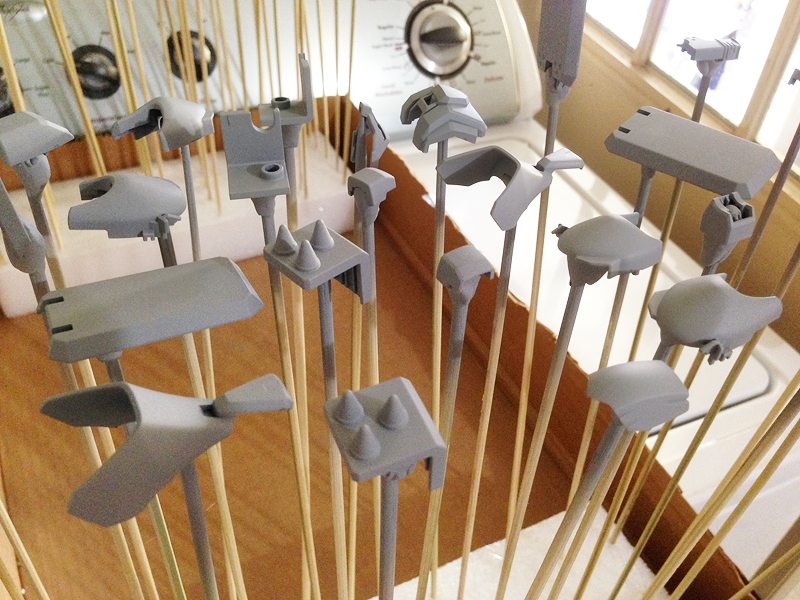 In addition, I primed the last group of parts that includes the mine weaponry, some tubing and chest plates. 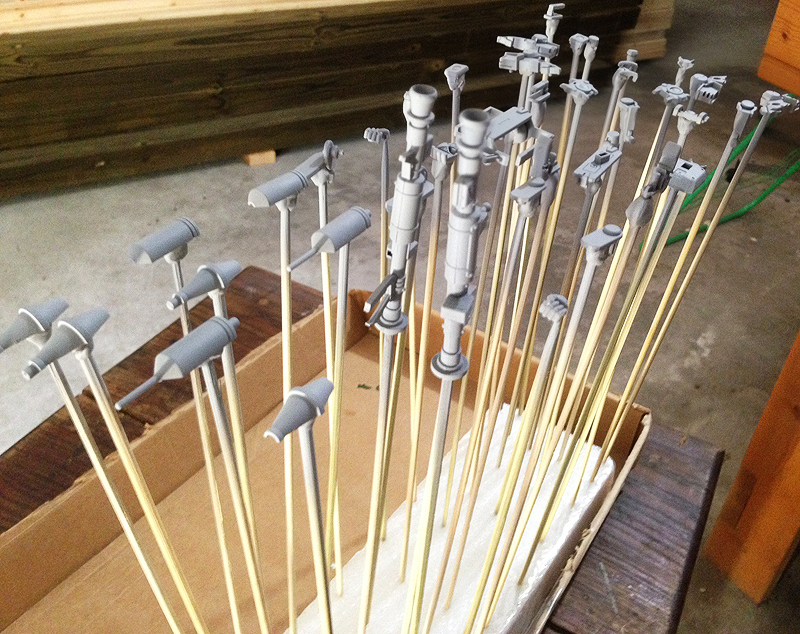 Finally, I color spray painted the extra weaponry and remaining inner frame pieces. 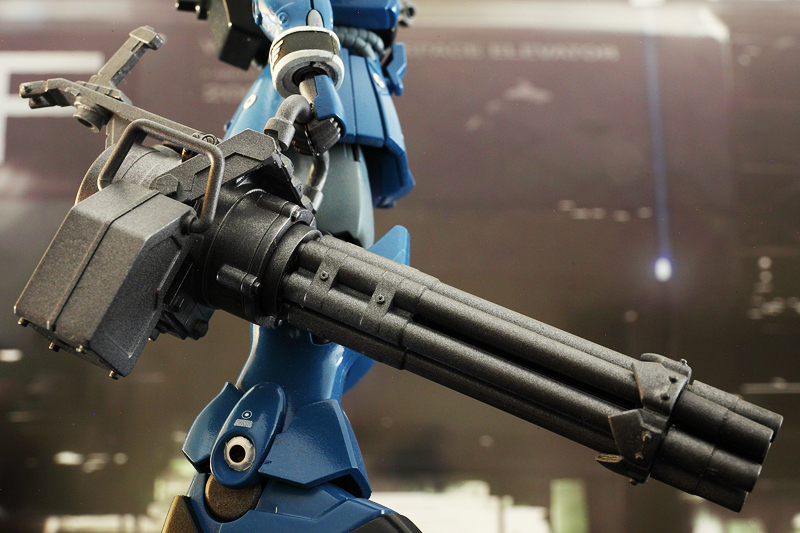 I’m pretty excited to see how the Kotobukiya Panzerfaust will look with the kit. 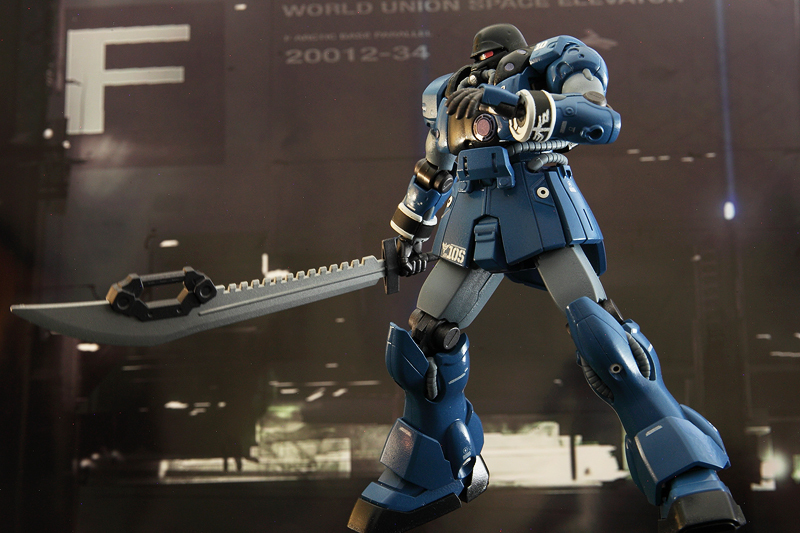 With the dual Panzerfaust I was going with a look similar to the Kampfer which this model, specifically with the magnetic chain mine, has some influences. 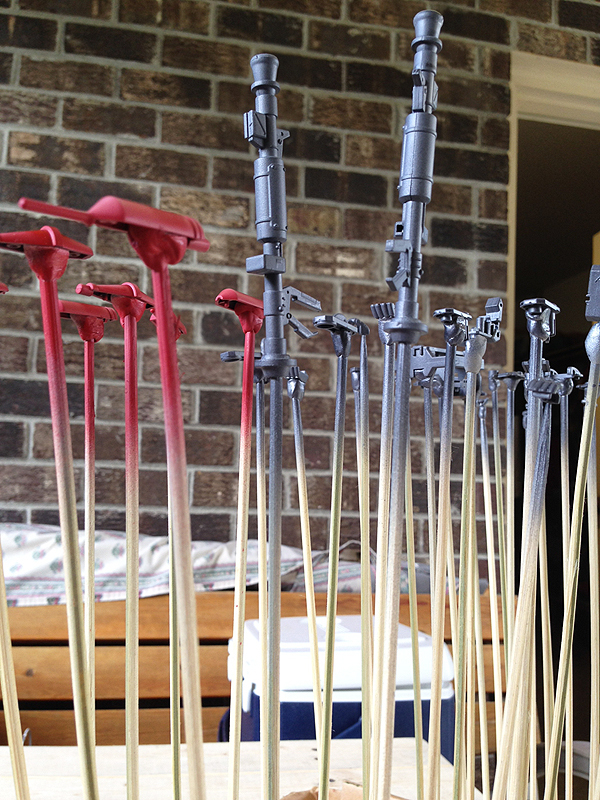 Hopefully, I’ll be able to finish color spray painting the last group and do some top coating for the next day of work. 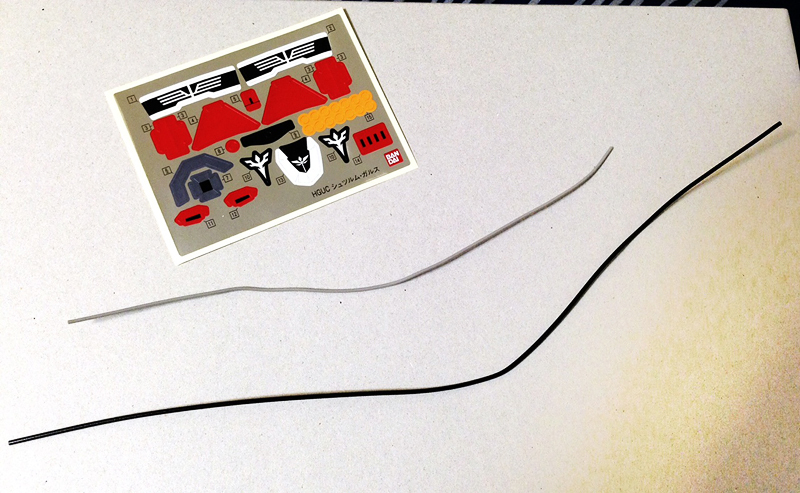 A few pieces of two of Kotobukiya’s Panzerfaust purchased for the HGUC Schuzrum Galluss kit. 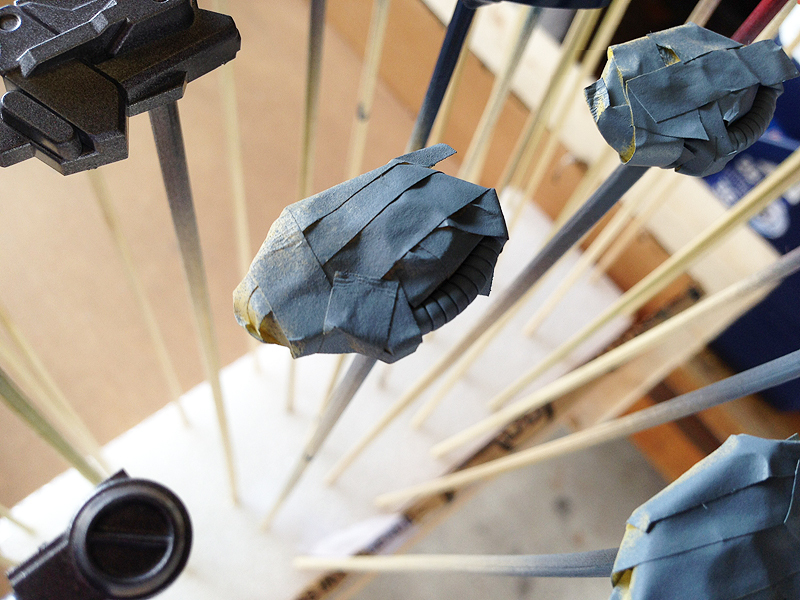 Background pieces are hands and inner frame pieces for the model. 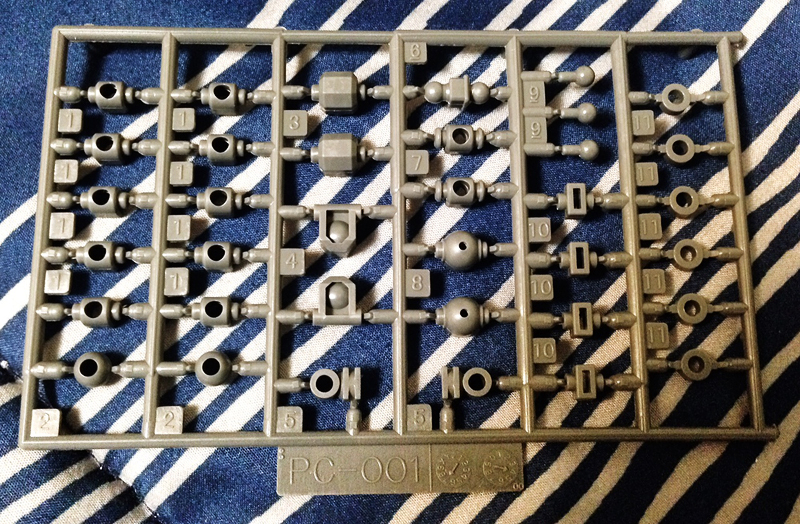 Four inner frame plates of the HGUC Schuzrum Galluss that have the inner tubing molded into them. Used masking tape to color separate them. 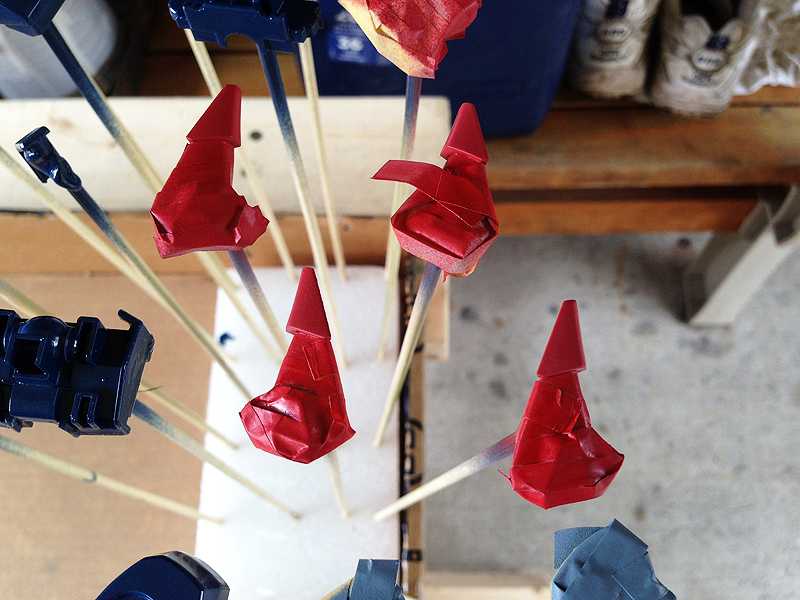 Masking then color spray painting the front ends of the HGUC Schuzrum Gallus’ feet. 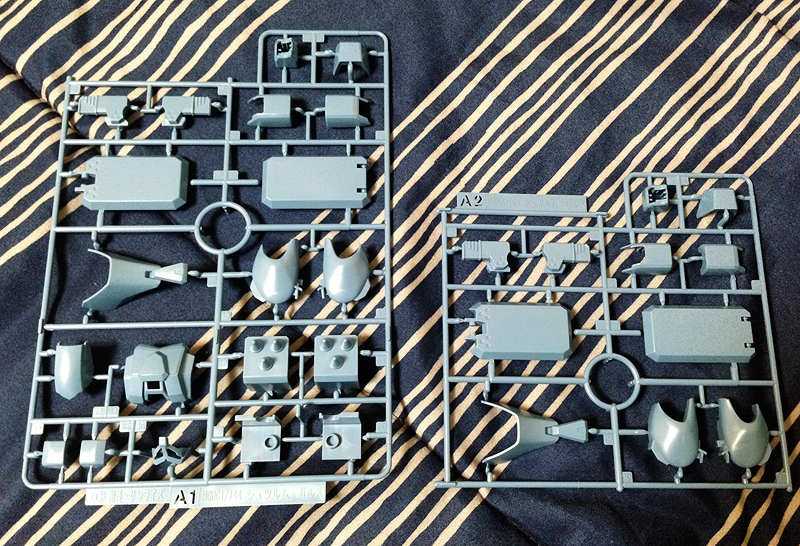 Two pieces of the mine weaponry backpack for the HGUC Schuzrum Galluss primed and ready to be color painted. 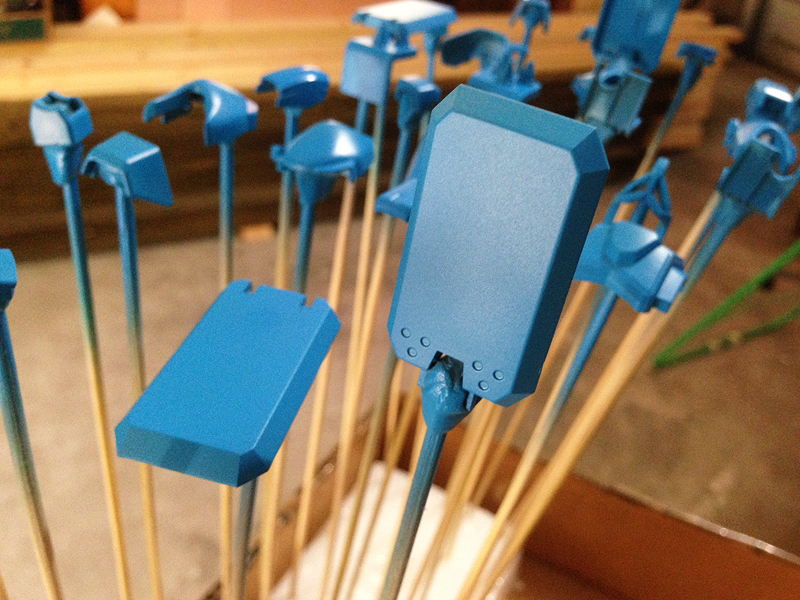 HGUC Schuzrum Galluss armor plate shields primed and color spray painted using Taimya Light Blue. 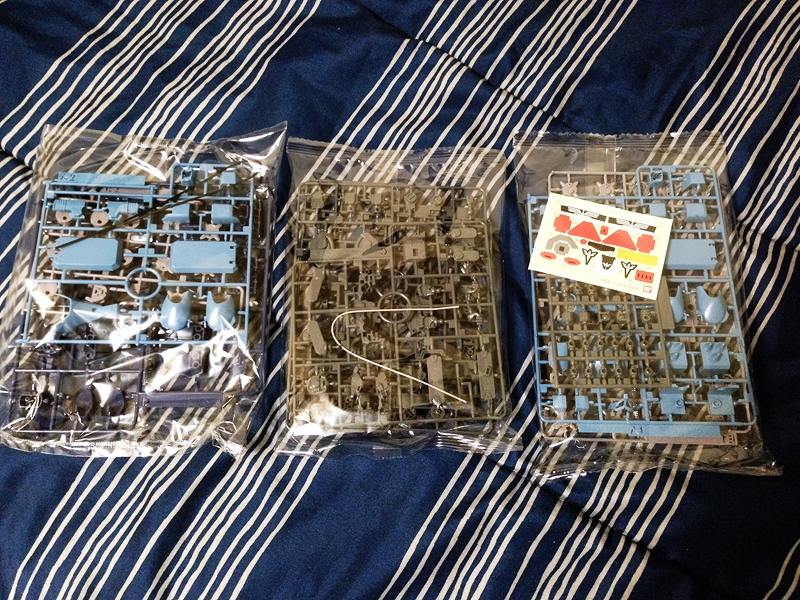 I’m using Tamiya’s light blue spray paint for the main armor plates of the HGUC Schuzrum Galluss model kit. You could see the color above on the kit’s shields. All I’ve got left to do with the main armor plates is some top coating and that group is done. 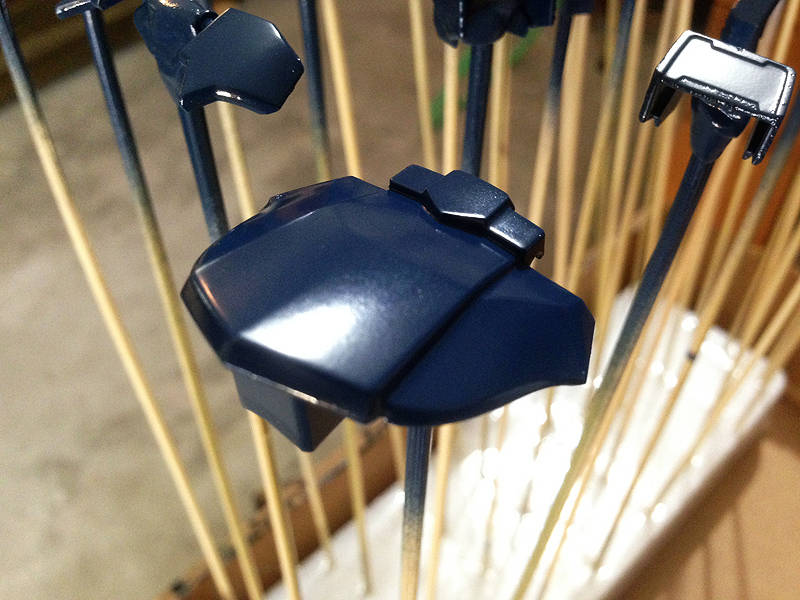 I also spray painted the secondary armor using Model Masters Blue Angel Blue (similar color to Navy), and the first group of inner frame parts using Taimya’s gunmetal grey. With the secondary armor, I will have to some masking for the red parts of the kit, specifically the front end of the feet and two small lower parts of the front skirt. Also I’ll be doing some masking on the tubing on the knees. 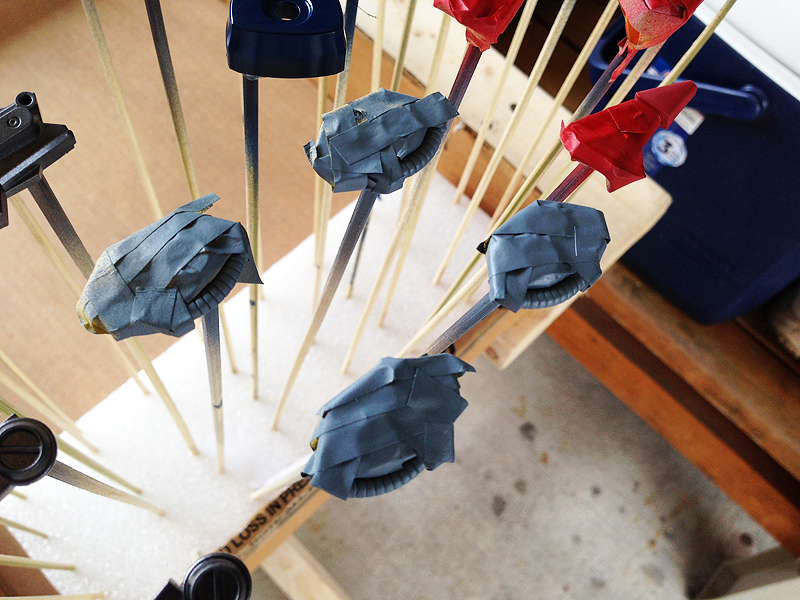 The last group, the mine weaponry, will hopefully be primed and ready to paint by Wednesday. 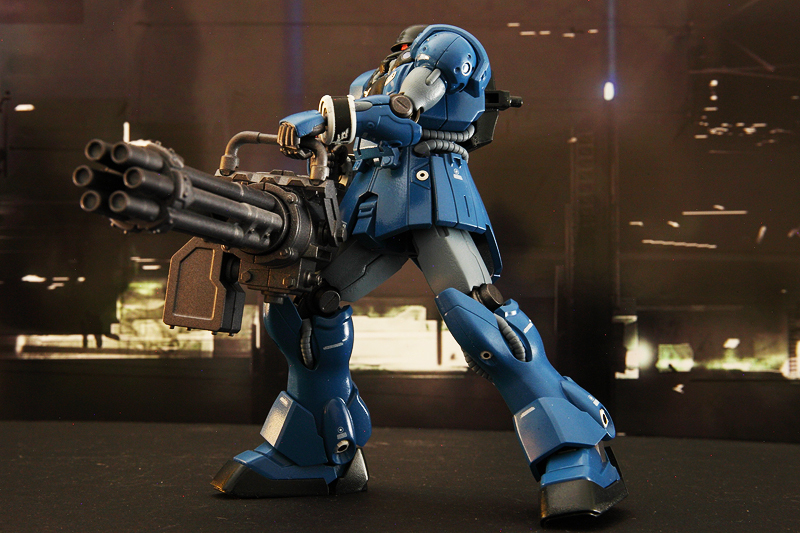 HGUC Schuzrum Galluss back skirt spray painted using Model Masters Blue Angel Blue spray paint. 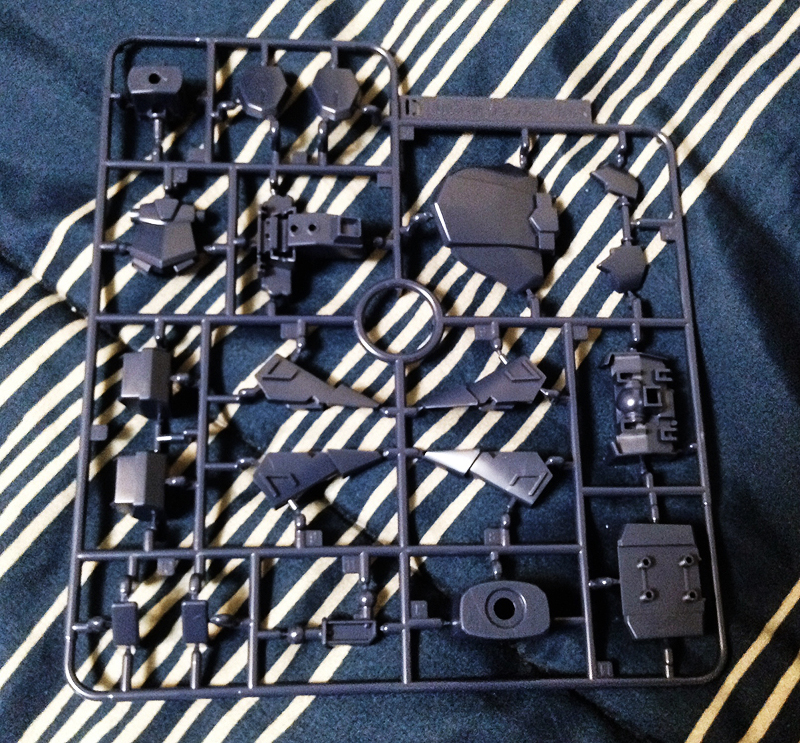 Some inner frame and secondary armor plates for the HGUC Schuzrum Galluss. 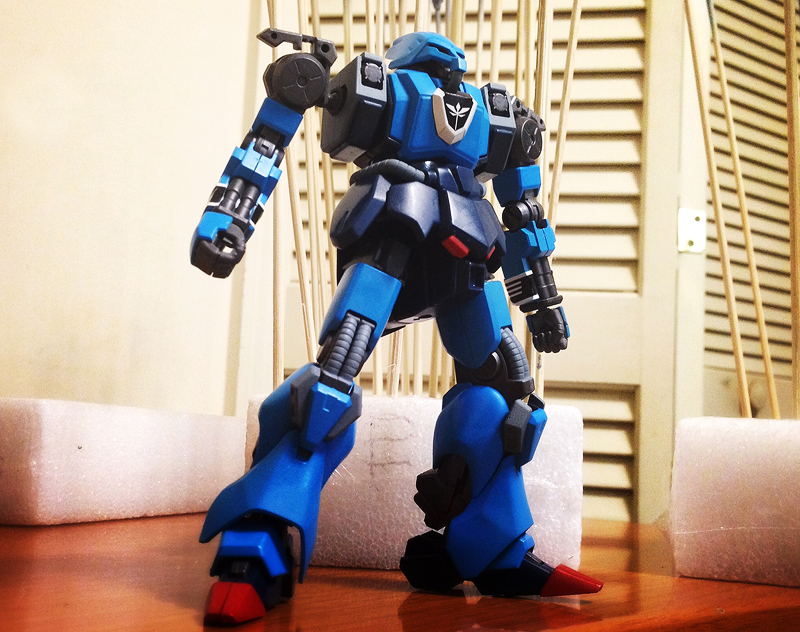 HGUC Schuzrum Galluss armor plates spray painted using Tamiya’s light blue spray paint. 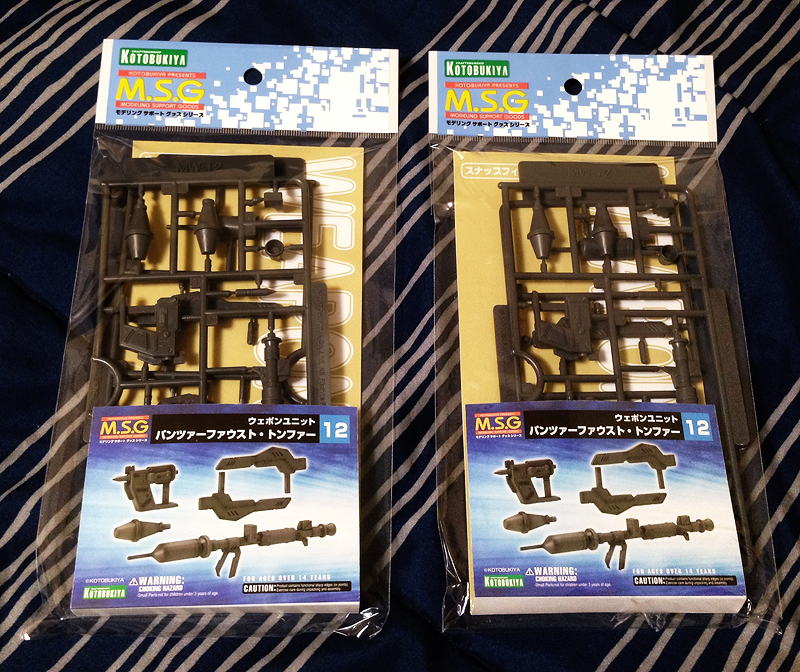 Some inner frame parts for the HGUC Schuzrum Galluss and additional weaponry for the kit that includes two panzerfaust from Kotobukiya. 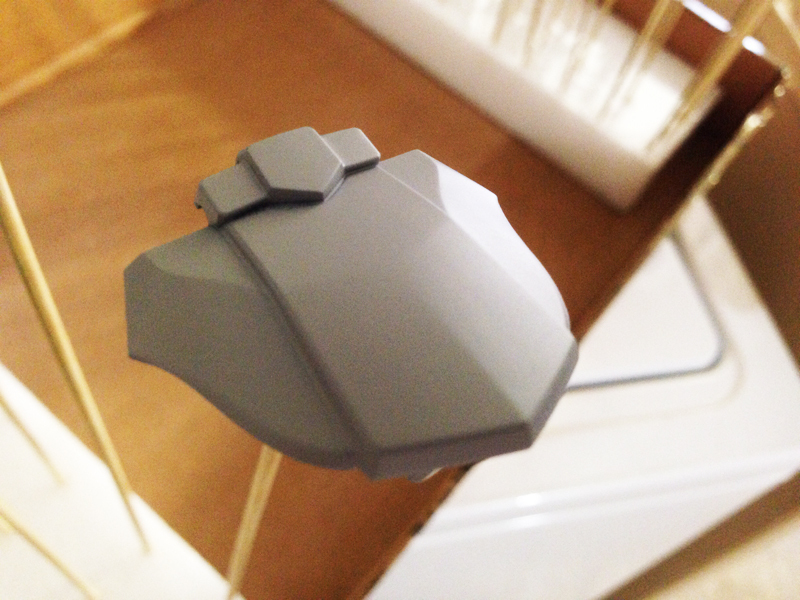 Back armor of the HGUC Schuzrum Galluss primed. I broke down all the parts for the HGUC Schuzrum Galluss into four groups which I will work on separately throughout the construction of the kit. The four groups are main armor plates, secondary armor plates with inner frames, mine weaponry, and extra weapons with leftover inner frame. As you can see above I’ve already finished priming, using Taimya’s gray surface primer, the back skirt armor of the kit which belongs to the secondary armor plates with inner frames group. I’ve also primed the main armor plates. I’m hoping to finish spray painting those two groups with light blue, dark blue and gunmetal grey paint sometime early this week. Foot of the HGUC Schuzrum Galluss primed. The front portion of the foot is supposed to be red while the rest is blue. This is accomplished by using a red sticker which I’m not exactly thrilled about, and will be doing some masking in order to paint the portion red. In addition, I’ll also have to do some masking on the main and secondary armor plating for a few parts, specifically the red parts and light bluish-gray tubing. The color separation for a few parts of the kit is a bit disappointing since the red colored armor parts of the kit use stickers. Now I’ve used stickers before to do color separation on Gundam kits, but this time around it feels a bit lazy on Bandai’s part. The front portion of the feet is red and the model comes with red stickers in order to achieve the color separation between the rest of the foot which is blue. 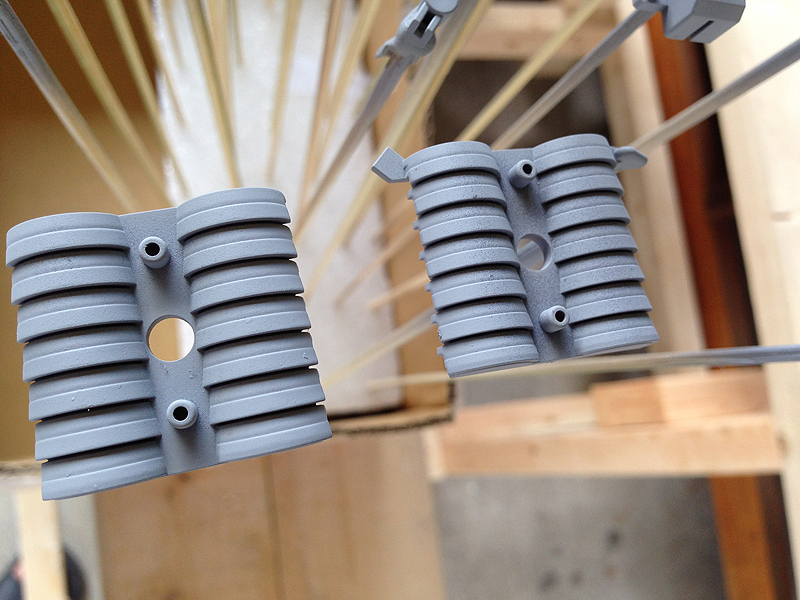 The tubing on the knee is also molded with the inner frame. Perhaps I’m asking a bit too much since this is only an HG kit, but nevertheless it means more work on my part which I’m fully invested in doing since the end result looks terrific, but it would have been nice if Bandai had color separated the kit a bit more diligently. Other than that I’m not seeing any other problems so far. As I’ve stated before I’ve purchased two Panzerfaust from Kotobukiya to beef up the weaponry on the Schuzrum Galluss, and I just recently got in some decals to make the kit a bit more detailed. My next step will be color spray painting the main and secondary armor plates with some inner frames, and priming the mine weaponry (which comprises of a lot of parts due to 14 mines included with the kit) and the rest of the inner frames and additional weapons(the Panzerfaust). HGUC Schuzrum Galluss main armor plates primed. 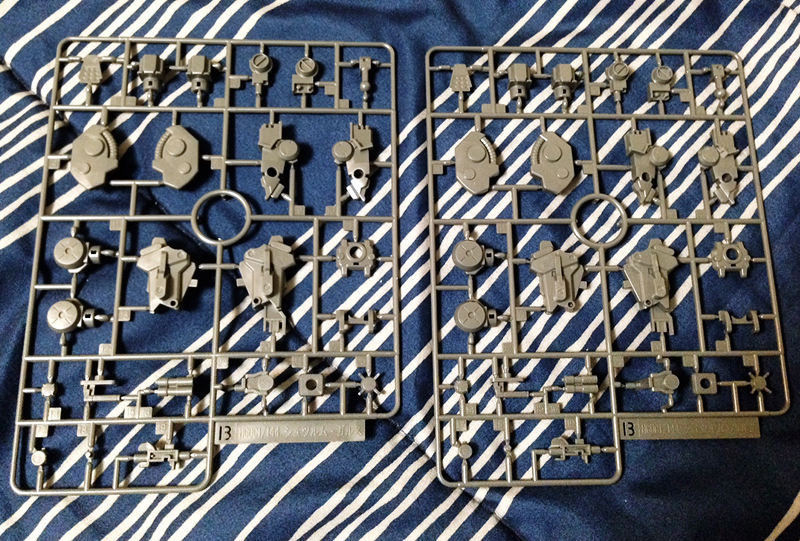 HGUC Schuzrum Galluss secondary armor plates and some inner frame pieces primed. 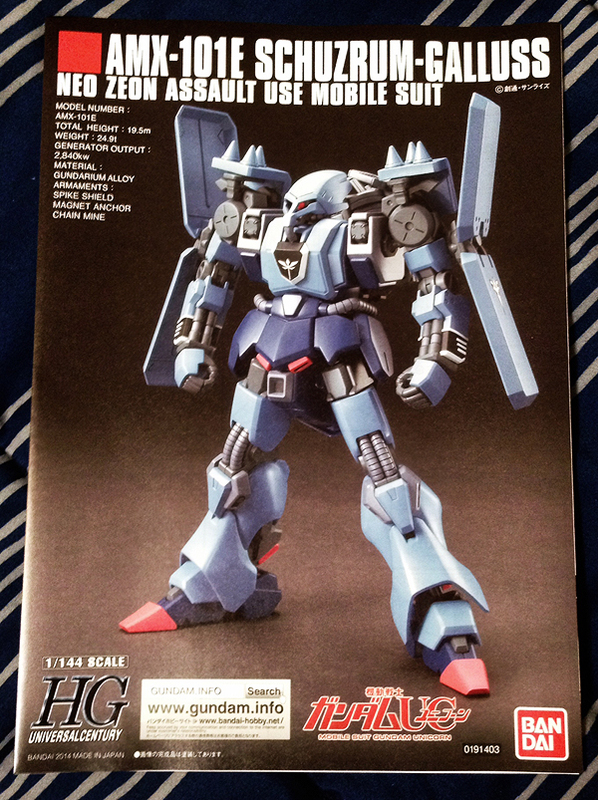 HGUC box for the AMX-101E Schuzrum Galluss from Bandai. Overall, I liked the Gundam Unicorn anime, although I did think the story wasn’t the best I’ve seen from the franchise, it featured some well-designed mobile suits like the Gundam Unicorn itself and the Kshatriya. 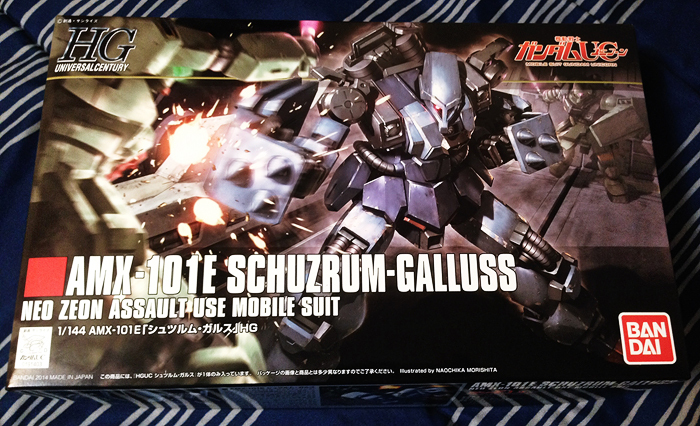 Which leads me to my latest acquisition with the HGUC AMX-101E Schuzrum Galluss model produced by Bandai. 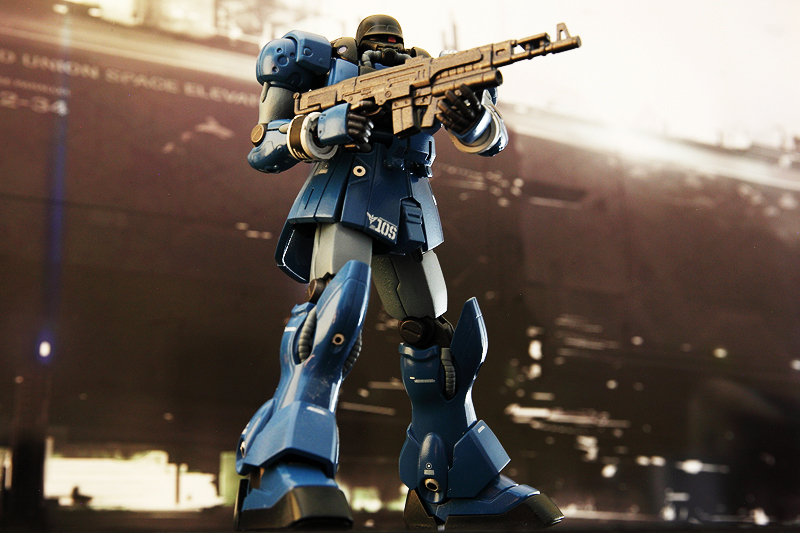 The Schuzrum Galluss is a Neo Zeon assault suit that was featured in a brief sequence in the last episode of Gundam Unicorn. Although its appearance was all too brief, the action scenes that featured the mobile suit was probably some of the best moments of the final episode. 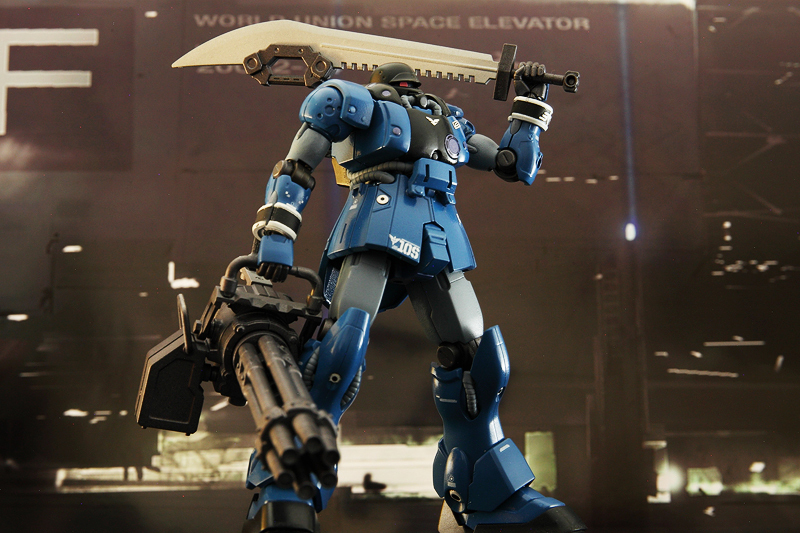 I like the design of the mobile suit with its Qubeley-like head and slim look. 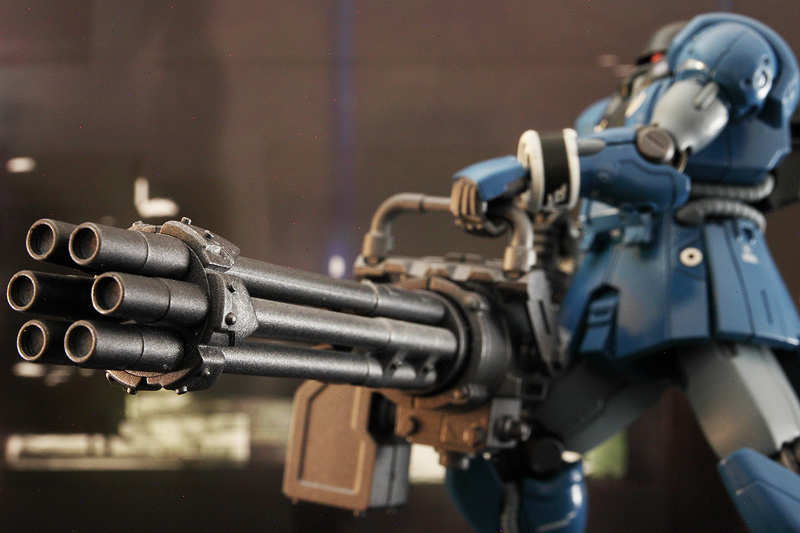 Another attribute that I liked was its weapons which includes its spike shields and magnet armor chain mine. With this model I’ve decided to add additional weapons for the Schuzrum Galluss which are two Panzerfausts from the Weapon Unit Kotobukiya line. 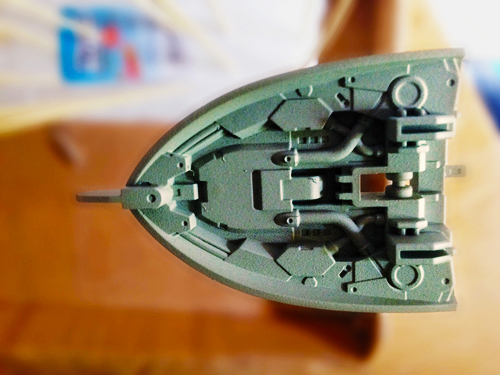 I don’t think it will take me that long to paint the model, since it has fewer plates compared to what I’m used to. Updates soon. 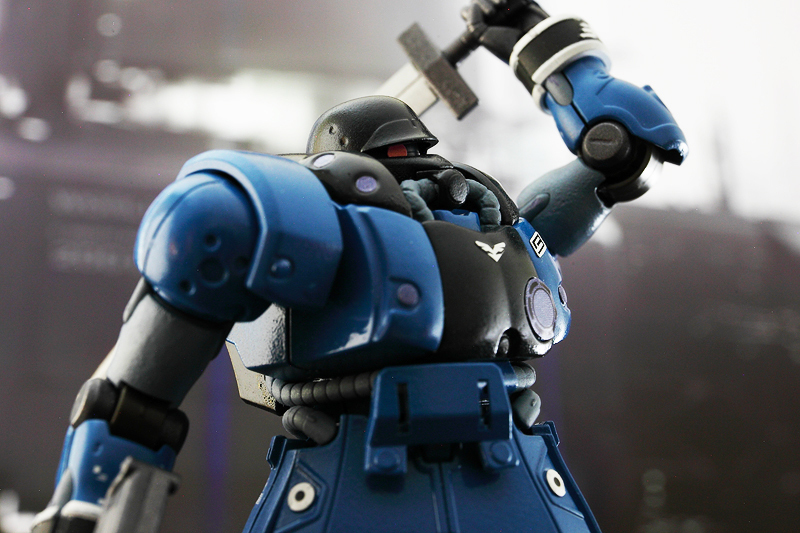 HGUC Schuzrum Galluss comes with three bags containing all the plates, accessories and decals for the kit. HGUC Schuzrum Galluss manual cover. 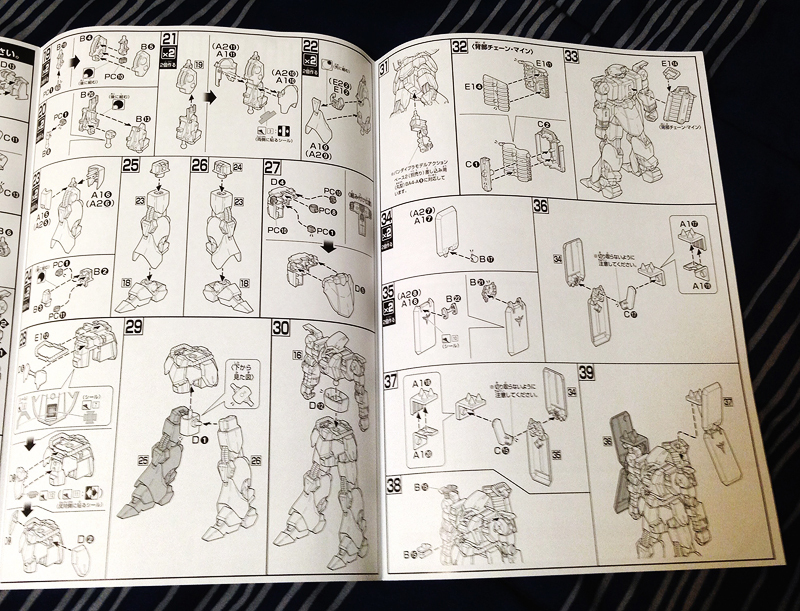 First two pages of the HGUC Schuzrum Galluss manual. 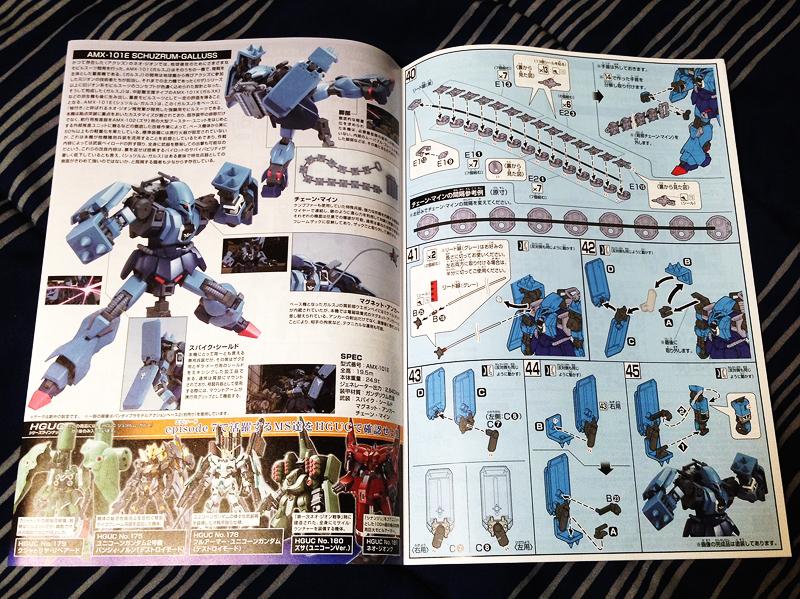 First two manual pages of construction for the HGUC Schuzrum Galluss. 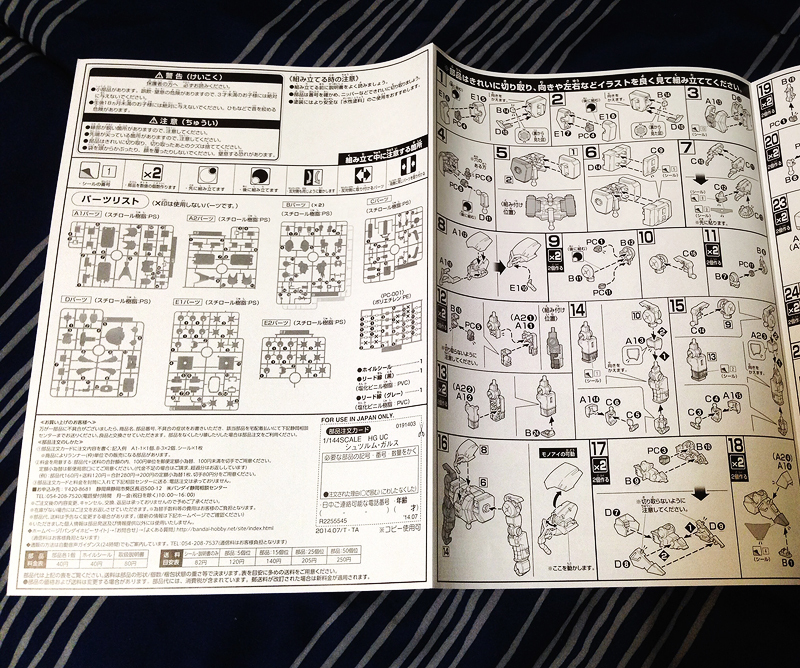 Last two pages of the manual construction pages for the HGUC Schuzrum Galluss. 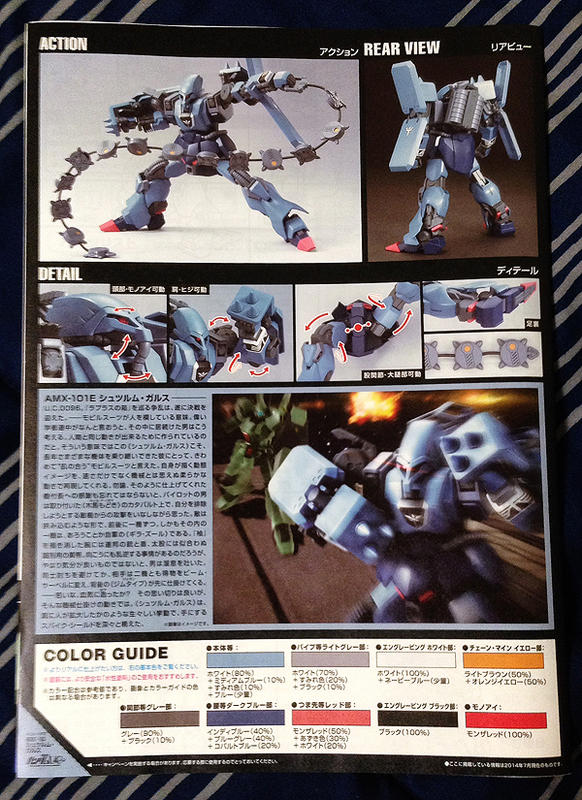 Back cover and paint color guide for the HGUC Schuzrum Galluss. 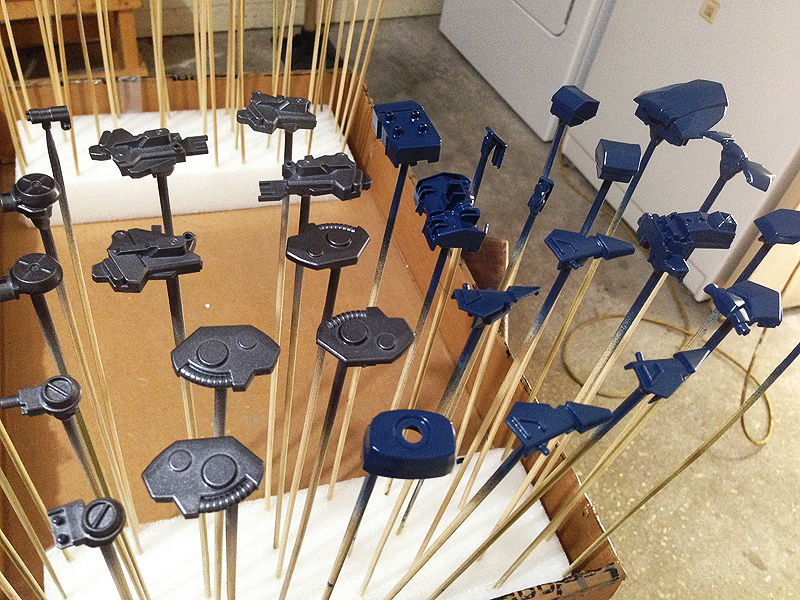 The primary armor plates for the HGUC Schuzrum Galluss. 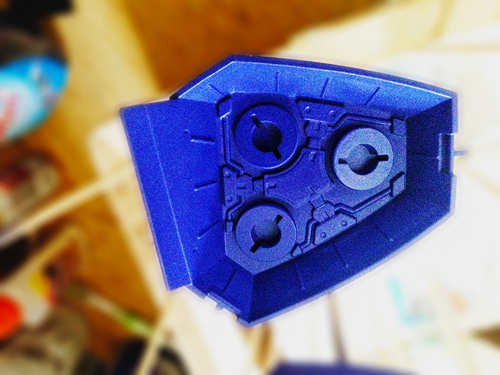 The secondary armor plates for the HGUC Schuzrum Galluss. 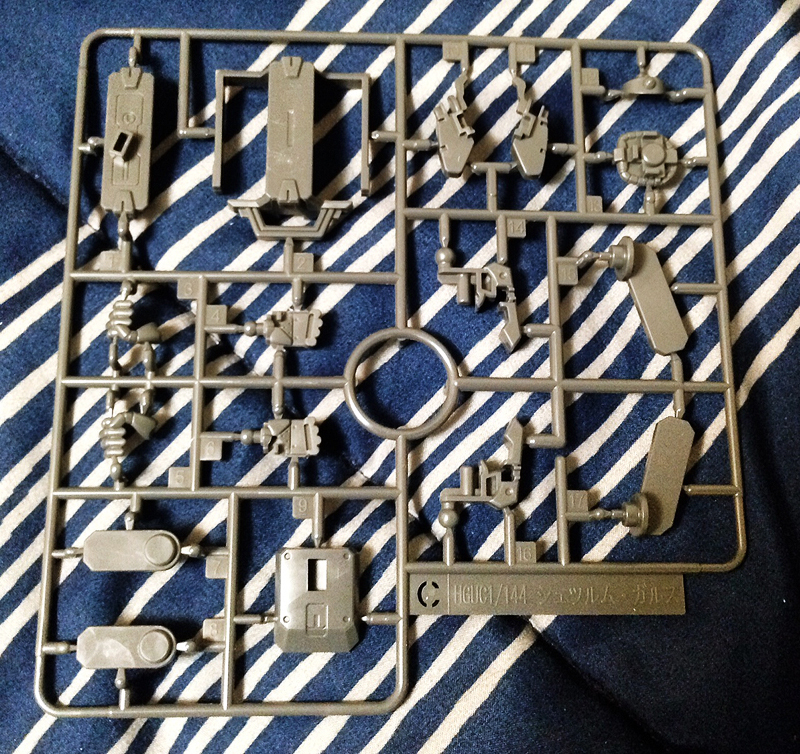 Plates for the magnet armor chain for the weapon contained in a backpack and in activation mode for the HGUC Schuzrum Galluss. 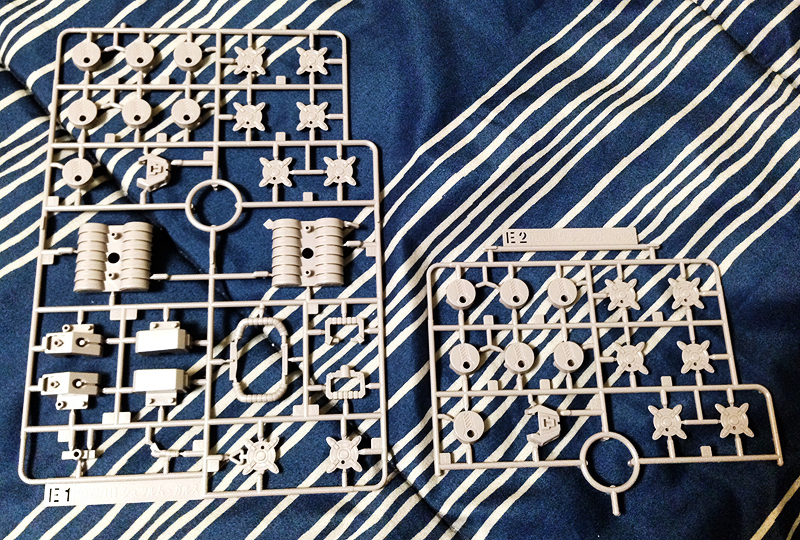 Plates for the inner frame for the HGUC Schuzrum Galluss. Additional parts, most dealing with the hands, backpack and shoulder of the HGUC Schuzrum Galluss. 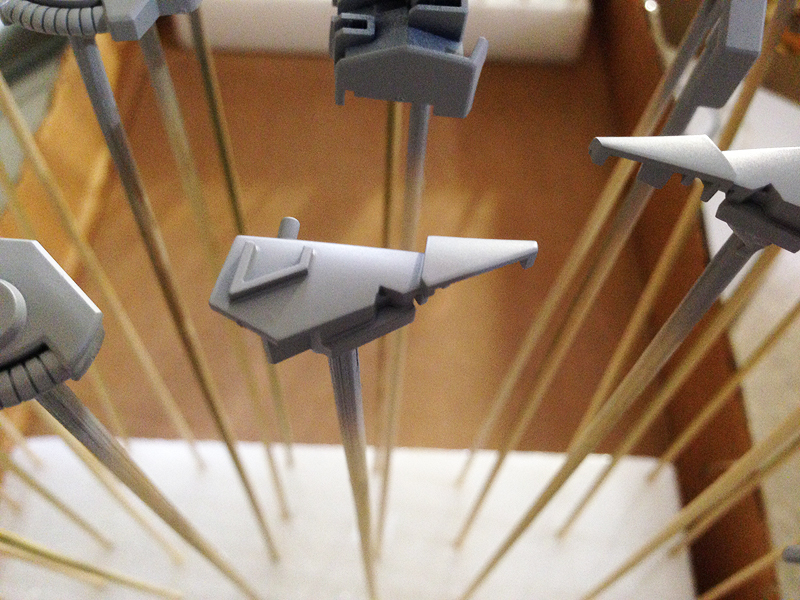 Joint fittings for the HGUC Schuzrum Galluss. HGUC Schuzrum Gallus decals and wires for both the magnet anchor chain mine and chest magnets. Two Panzerfaust produced by Kotobukiya that I purchased for the HGUC Schuzrum Galluss. 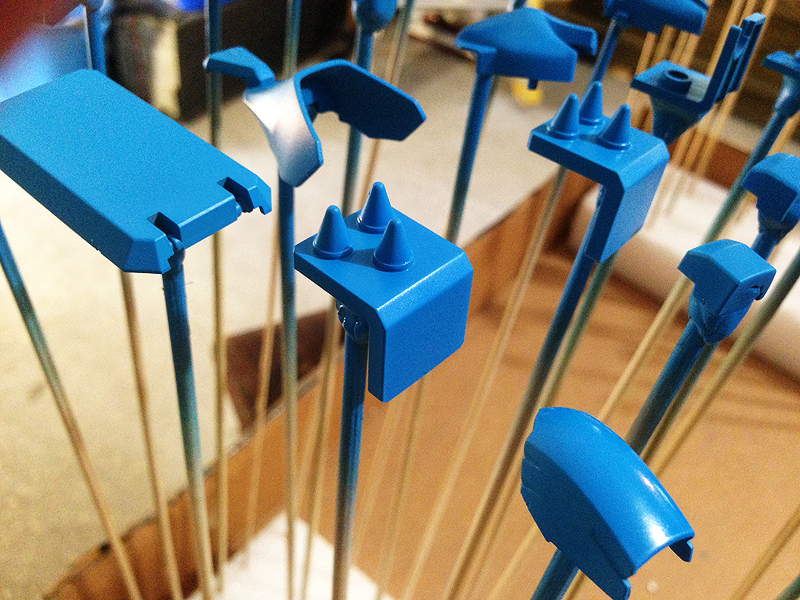 First coat of paint using Tamiya’s blue violet spray paint. 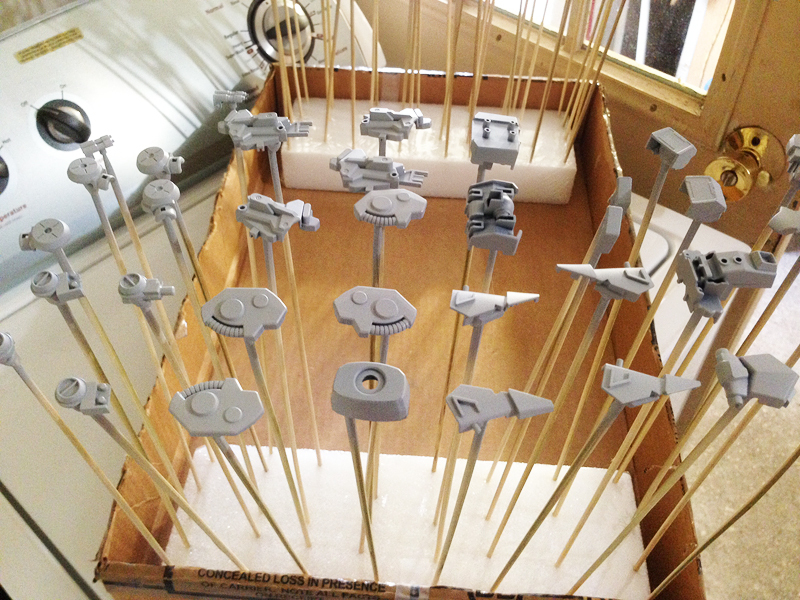 It took me about 2 1/2 cans of Tamiya grey primer to cover all the parts I intend to paint on the HGUC Messala. As you can see above I’ve already done a first coat paint on all the parts. The pictures that you see are done with my iPhone using cam apps, since I find it easier and more practical than lugging my DSLR out. One thing that I will have to do on this model is some masking to spray paint a few parts, specifically the yellow markings on the kit. I’ve seen some reviews online and YouTube where the yellow stickers, especially the one on the head, look bad. I’ve had a few bad experiences before with some stickers, so this is a must for me. I’ll also do some masking on the six small thrusters which are supposed to be dark blue/purple outside and red inside (like you see on the box, posters and anime). Normally the last thing I would do is top coat everything AFTER placing decals on the kit. Because of the transformation, I’m a little concerned that paint on certain pieces may scratch off. So what I’m going to do is top coat every piece of the kit (some added protection), put it together, place the decals on the kit and then put another coat of top coat. I also finished watching Zeta Gundam. Great show and may put up a review on it. 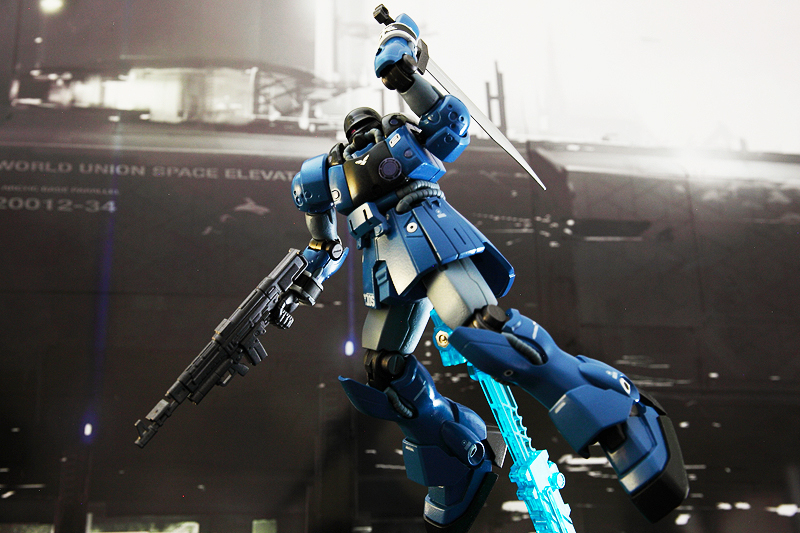 Oh yeah, definitely getting Scirocco’s ‘The O” either in MG or HGUC form. One of the few pieces I’ll be masking. 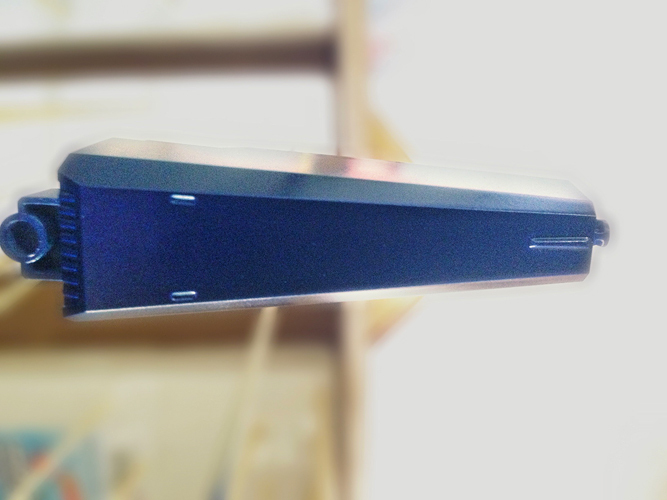 The little piece protruding on the top on the right is what I’ll be painting yellow. 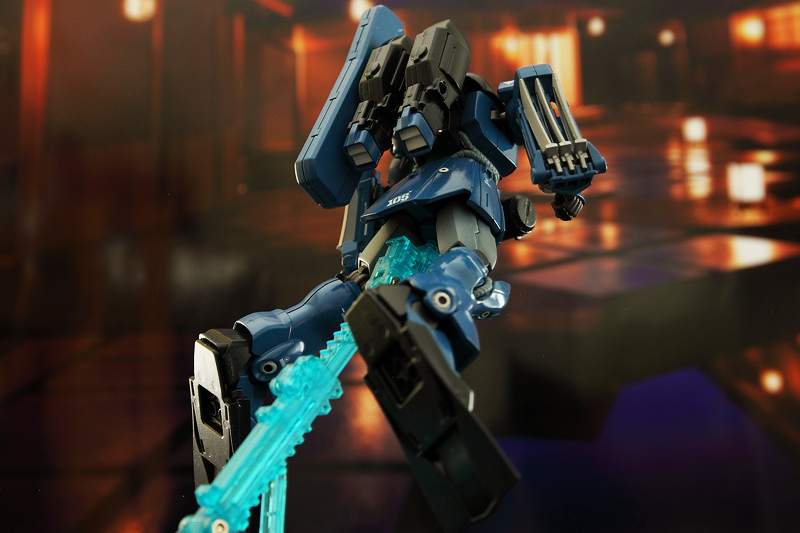 Some inner frame action that’s not covered up when the Messala is in Mobile Suit form. You can actually see this piece in certain angles. It’s the inner back skirt mechanics.